1. Currently according to Roberts Rules of Order the Mayor is a voting member of every committee and eligible to be named or elected as chair of any of the committees (Clarifying information: former Mayors have chosen not to exercise these privileges). Mark Campbell made some comments last council meeting. I'm tempted to characterize them but you can watch them yourself. Below the video I've pulled forward a couple of the articles where I've written my thoughts on the use of Emergency Legislation. I've also posted the text of some email traffic where I've tried to engage council on the issue. So you want to be Mayor? Why not? The job comes with a paycheck! Anyone know off the top of their heads what FWTM supports? I know this may sound crazy but my wife and I are being harassed and terrorized. For over 2 years this has been going on and we cannot get nobody to help us. For the last 8 months they have been putting some kind of gas into our home. I have talked to the police a Lt. McMillan and the FBI advised us to talk to the police chief but that was impossible to do no one will help. I have asthma and this is not doing me any good and who knows what other health problems may come from this. Republic has delayed pick-up by one day. They are conducting a “blast-call” to their customers for notification purposes. Just letting you know in case you are asked by a resident. Thanks. "Due to the imminent weather coming into our area, the committee meetings originally scheduled for tonight, February 4th have been CANCELLED. 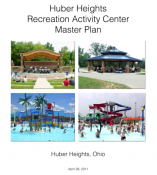 This includes the Public Works Committee and Administration Committee. Change the way HH city does business…"random" survey's should not be "random" if residents want to participate in a survey but are told they cannot because the survey was/is random. OPEN government is not conducting a random survey then using the results of that survey to make policy! 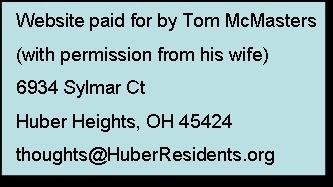 Let's see an open call to ALL residents (taxpayers and others), property owners and renters alike! What is the best course forward? 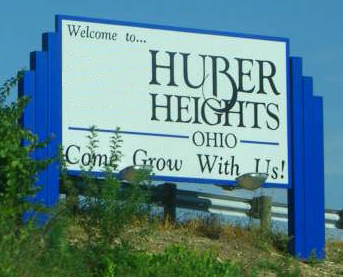 Are Huber Heights residents interested in a town hall or internet discussion on this issue?